Comments: Station Approach, which now curves to join Northumberland Avenue. Comments: Another view looking down on platform 1. Comments: An early postcard view of Laindon. Comments: An early view of Laindon with a gathering of station staff in the background. Comments: A view of Station Approach from the stairway. In the late 1800s Laindon was quite sparsely populated but with the coming of the railway change was evident within a short time. A new direct route linking Pitsea with Barking was proposed, with the provision for five new railway stations. The planned course of the new line would pass through the then parish of Little Burstead where its boundary met that of Lee Chapel parish and it was here that the L.T.S.R. acquired land for a new station. Although geographically in the wrong location, the Laindon parish boundary being about a quarter of a mile away, the company chose to call the station Laindon. An Act of Parliament authorisation the new route was passed on 24th July 1882, and by 1885 the line was open as far as Upminster. East Horndon, the first of two intermediate stations before Pitsea, opened next in 1886, followed two years later by Laindon, which opened on 1st June 1888 along with the now completed line. The station layout at Laindon closely resembled East Horndon (renamed West Horndon in 1949), even down to the down side placement of the station masters house and booking hall. The two platforms were both provided with a weather canopy, and passenger access to London bound trains was reached via an ornate overbridge. Sidings were also laid and a goods shed built. Accommodation for other rail staff was also provided in the form of a single terrace row comprising eight houses. These were called Railway Cottages; numbered 1-8 and built alongside the line on the down side approach to the station and close to the signal box. As early as the 1920s, and possibly earlier, passengers could purchase cigarettes and tobacco and various other items from a Finlay's kiosk. 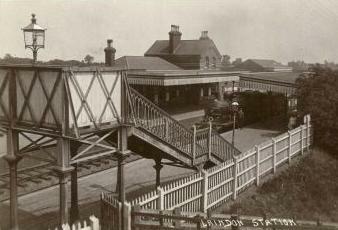 For many years Laindon remained little altered, the first major change coming in 1933 when the up platform was converted to an island. This third line allowed a passing loop, and the new third platform (platform 1) became the new up when the original one became reversible in 1957. This change, including the renaming of the down (Shoeburyness bound) platform 1 to platform 3, enabled starter trains to operate from platform 2, which, despite a withdrawal attempt by rail operator c2c in 2006, continue today. A new signal box was added to the island platforms, which also had its pedestrian overbridge replaced and extended to the High Road. New platform buildings were also erected under a longer roof canopy. These were for a gentlemen's convenience, a Ladies' waiting room & convenience and a general waiting room. The platforms were also extended to 700 feet. A further addition in the form of a small W.H. Smith & Son kiosk selling newspapers appeared around this time and built across the platform against the side wall of the general waiting room. The Finlay & Co. Ltd. tobacco kiosk was positioned lengthways in the centre of the platforms adjacent to the Smith's kiosk and close to a weighing machine. When Basildon was designated a new town in 1949, British Railways were in no immediate hurry to provide a station for Basildon; Laindon and Pitsea were then considered sufficient to serve the area. 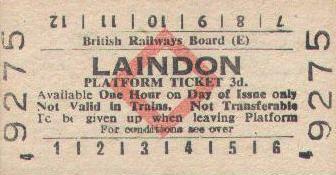 Perhaps to reflect this the nameboards at Laindon were changed to 'LAINDON FOR BASILDON' possibly during the 1960s up to the time of Basildon opening in 1974. The Goods service was withdrawn on 5th June 1967, though a goods shed remained empty and derelict for years after. More recently the island platforms saw change when the signal box was taken out of service on Sunday 4th June, 1995 when the line was resignalled between Laindon and Chalkwell (signalling from then on being controlled from Upminster). The detached sales kiosk was also removed around the same time. Station Approach no longer has direct vehicular access to the High Road; Northumberland Avenue now being the entrance/exit route, and the cafe, much frequented by bus crews, was demolished in the 1980s along with another small building used by various taxi companys like Sidney Farmer's and Basildon Radio Taxis. One building on the station side still remains and is now in use by a local taxi company, having formerly been (from 1968) the Watson, Temple & Waymouth, and more recently Watson, Temple, Talbot & White estate agents office. The far end of the goods yard was for many years used by a number of locally based coal merchants that included Morris & Farmer, A.H. Hall (from 1970) and Hayes Fuels, who all kept a coal depot there. Another small building in the yard was used by the Evening Standard/News newspaper group. Opposite the booking office is the Station Gate shopping centre, built partly on the site of the old goods yard and Berry Boys boxing hall in the 1990s. Around this time, the remainder of the goods yards was cleared and a large commuter car park created, which from autumn 1990 to 1991 was used for car boot sales. The original up side (London) car park - created in 1966 on a bed of cinder and accessible via a side road at the foot of the Langdon Hills bridge incline - was relocated (albeit in reduced size) onto vacant land closer to Valence Way, when Mandeville Way was constructed in the late 1980s. A new concrete stairway up to the High Road was built to replace the original steps which had led down to the car park. This car park has since closed and in the 2000s new residential properties of Marlborough Drive and Milton Green now cover the site. The right of way pedestrian occupation crossing a few hundred yards or so beyond the station towards Basildon was closed off in 2012 and a laminated no public right of way notice was tied to the fence. This crossing was possibly established at the time the line opened, and beyond that, on the up side buried amongst the undergrowth is the rusted remains of a former siding, that for some reason was overlooked once the spur to the mainline was lifted sometime around the early 1960s. The west side footpath over the overbridge, once the route of the B1007, is no longer used by pedestrians having been cobbled over when a new footbridge was constructed in the 1990s. 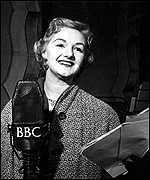 The station house is famous locally as the birthplace and first home of the former stage, screen, radio and television actress Joan Sims. She was born the only child of John and Gladys Sims on May 9th 1930, her father then being the station master, and lived there from 1930 through to 1952. Educated at St. John's, Billericay, and Brentwood County High, in her early years she was a member of the Langdon Players and would often take part in local stage productions. She was perhaps best known for her appearances in the 'Carry On' films - 24 between 'Nurse', the 2nd in 1959 and 'Emmannuelle', the 29th in 1978 - and a blue circular plaque commemorating her life, unveiled on May 9th 2005, now adorns the outer wall of the building. Her autobiography entitled "High Spirits", published 5th June, 2000 (ISBN: 1-85225-280-4), recalls how she would often entertain the waiting passengers with impromptu routines on the station platform. She died on June 28th, 2001 aged 71. The station no longer has a station master, the final one departing sometime in the 1970s, and the station house has been let to a number of different businesses. Its first new use was possibly in the 1980s when local estate agents Bricks & Mortar opened an office there. When they vacated, the house was unoccupied for many years and to let again before being acquired by another local estate agent Quirk Deakin who opened their Langdon Hills office around February/March 2004. When Quirk's vacated Second Steps out of school club moved in for a time and it's now a barbers shop and florist. Through the years the station has retained its importance to the area, firstly with 'eastenders' looking to holiday in the country, and now as a starting point for the local population who choose to commute each day to their jobs in the city. (1) A Laindon nameboard reading 'Laindon For Basildon' and seen on this page was in 2003 located in Alberquerque, a city in the american state of New Mexico. How it got there is unknown. At that time it was for sale. Layed flat its dimensions were given as 72" (6ft) length by 24 (2ft) width and a depth of 1 inch. It is not known if it was sold or if it still exists. (2) William Knight, platform newsagent vendor. The oldest newsagent in Laindon, est. 25 years in 1932. (3) Joseph Pettengell, newsagent & stationer, Laindon Station (1923) and Lending Library, Langdon Hills. (4) John Henry Sims the father of actress Joan Sims was station master at Laindon from c.1926 to 15th September, 1952 when he retired to live at Southchurch with his wife Gladys. (5) Two former station masters following Mr. Sims were Walter Burch, who was in charge in 1956, and Mr. Hearn, who took over around the turn of the 1960s. Text researched and written by William Cox, 2004 with revisions 2005-2007,2012. Copyright © 2004-2007,2012, B. Cox - Basildon History Online. All rights reserved.